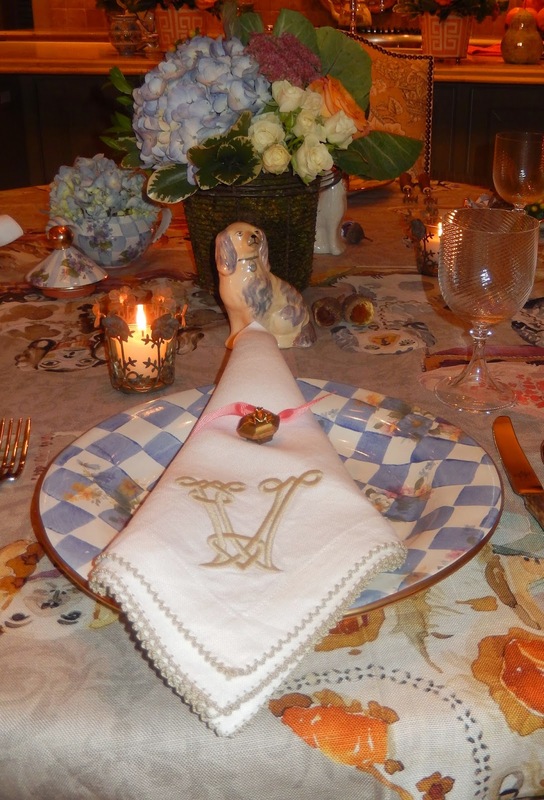 Both the flowers and the fabulous tablecloth are thanks to my friend and florist, Kyle Robino of Old Market Habitat. The napkins are from Number Four Eleven in Savannah. The plates are discontinued MacKenzie-Childs. I found them on eBay! I found this trim on Etsy ~ a perfect finishing touch. The small ceramic dogs are also from Etsy. The flatware is from Horchow, here. The glasses are by Nason Moretti, here. This table topper is a show stopper. I am in awe of people (Kyle Robino) who can sew. I would love to be able to sew! I found the last of this amazing fabric on Etsy, but you can find it here. Kyle Robino is an artist on so many levels! She makes it very easy to put together a pretty table! 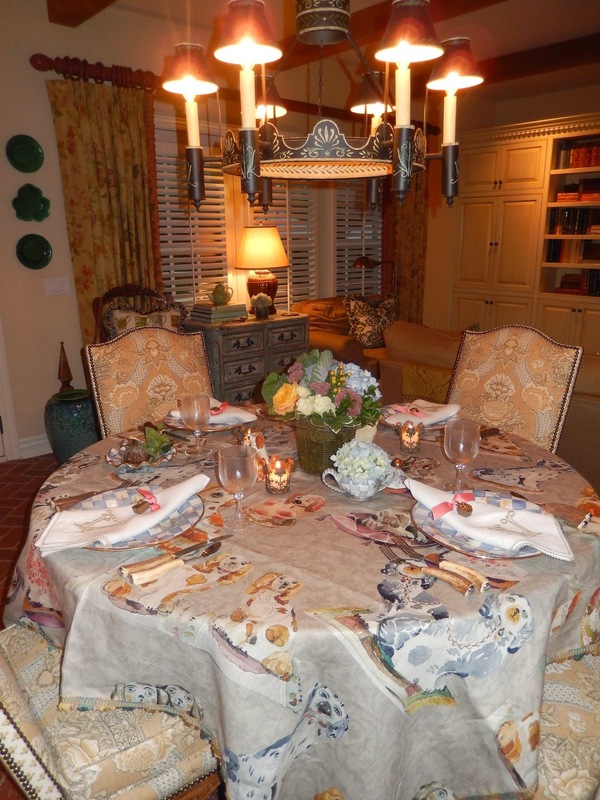 Hi Jan love it all the Staffordshire table cloth is too cute and charming...and love the napkins, the flatware, the plate, the whole enchilada...you did a beautiful job tying it all together! Beautiful! I also love your new painting and throw pillows in the background! There are so many beautiful things to savor that I wouldn't even be thinking about food being served! Jan, every detail is perfection! I love the McK-C Honeymoon pattern, though I only have a sugar bowl in this pattern. It was a gift for my 50th with a note about the sweet years ahead. 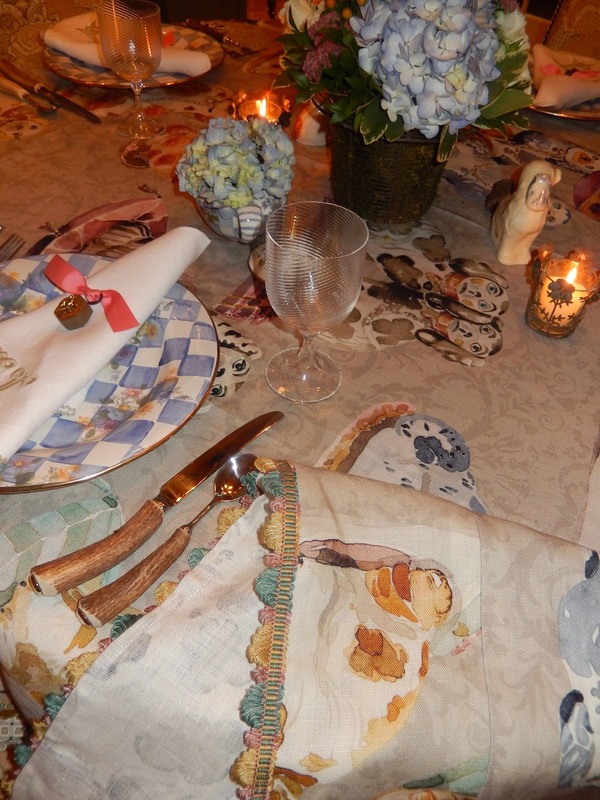 Your tablecloth and cute little doggies make me smile. Love the idea of using the mini bees on the napkins. I have a small group of Trace Mayer bees hanging in my office. Thanks for sharing this adorable table. What I love the most is your sharing and friendships. Kyle is sure a sweetie pie and your table looks positively smashing. I love how inviting it all looks. Your personal touches shine! Does your husband just adore you?